You would be amazed at the many different things you can do with an egg carton. Occasionally, of course, if I remember, I will post different egg carton activities. Today I have; egg carton bugs. The best type of egg carton to use is the cardboard type. The Styrofoam ones don't hold paint too well. We made four different kinds of bugs with one dozen-sized egg carton. 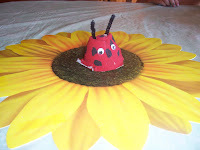 We made a one segmented bug, ladybug; a two segmented bug, spider; a three segmented bug, ant; and a caterpillar that could have as many different segments as you would like. First, you will need to cut your egg carton into the different size segments you want. Then give your child some paint and let them go. 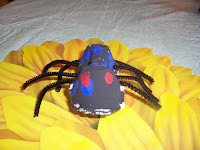 My son helped me to paint the bugs here. He added spots and multiple colors--let them have a ball. After the "bugs" dried I used pipe cleaners for legs. I had to pierce a little hole in the area I wanted the legs to go in, because the pipe cleaners were not strong enough to push through themselves. I used one pipe cleaner for 2 legs: I pushed the pipe cleaner in one side and came out the other. ( I did see in a book that someone used small sticks to make bug legs. You would probably have to use a strong glue like tacky to make them stay.) I did not add legs to the caterpillar--just too many. 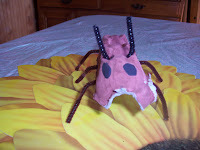 I also used pipe cleaners for the antennae. I pierced two small holes in the top and fed the pipe cleaner in one hole and out the other. If the pipe cleaner was too long, I just cut it. 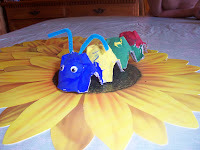 The bugs were very easy--the children will probably need help with pushing the pipe cleaners through. The look much cuter than the real things. They are also good to use for teaching the more scientific aspects of bugs like: number of legs or different number of segments. Those are adorable. Thanks for visiting my site. I will be visiting more often.